Time flies! There are only 2 months left to the ski season and we can feel the days getting longer. That means longer ski days! (See side note) Even with more sunlight throughout the day, it’s still the middle of winter and our snow operations team is working hard to keep the conditions at their peak. During these cold periods, one of our team’s secret weapons is the powder-maker. We recently went to visit our friends over at snow maintenance operations so they could show us what powder-makers are and how they use them. First we got a quick history lesson. Did you know that until the 1960’s, ski resorts used to groom trails by snowshoe and shovel? We didn’t! They would walk up and down the slopes to compact the snow and fill certain areas by shoveling. In the 60’s they revolutionized grooming by using metal drums behind a vehicle to flatten the surface. That then turned into the aerating “powder-maker” which deposits the snow without flattening it. The grooming technique that is most popular nowadays is the one which uses tillers which creates the famous corduroy pattern and came onto the scene in the late 1980’s. We use tillers most of the time on our slopes, but every so often we take out the old-school powder-makers to recondition trails and bring them back to life. 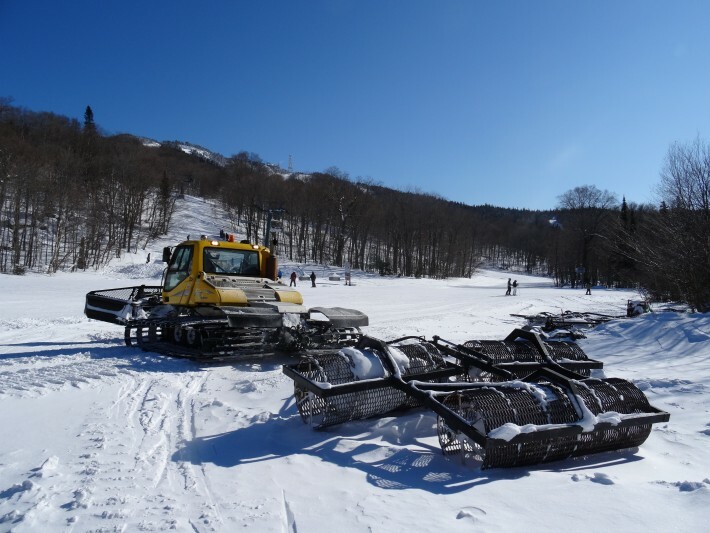 The trail maintenance team will start by going over the trails with the snow cats to break the icy crust and then bring out the powder-maker. While the tillers will compact the snow surface, the powder-maker will loosen the snow and ice. By spinning around in the chicken-wire drums, these pieces will turn into little snow balls that are filled with air. If you’ve ever skied on these you will notice how easy they are to carve through! Although the finished product might not look as pretty as corduroy, it lasts longer and is easier to ski in. The snow maintenance team recently tested the two grooming techniques on very similar runs and the results were surprising. 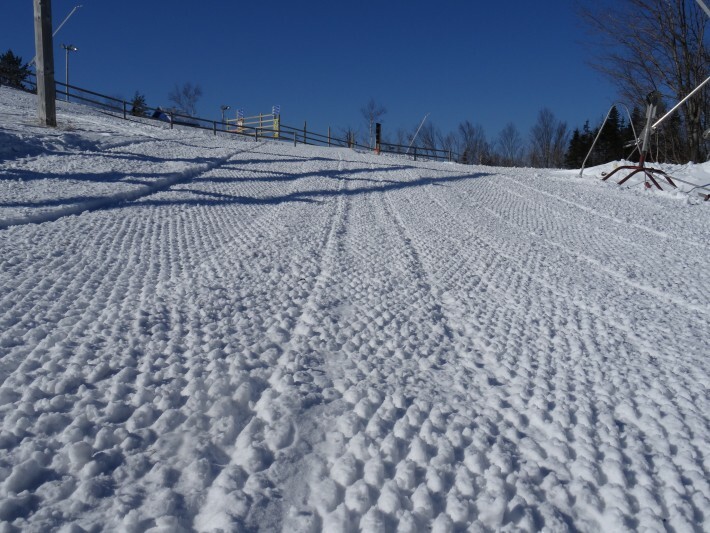 Because the corduroy is so compact, the surface will get very hard and slick in frigid weather. Unwilling to pick up too much speed, most skiers have a tendency to skid along these trails rather than carve them. This resulted in the surface getting used faster. The powder-maker groomed run saw skiers making more controlled turns and thus lasted many hours longer. With the temperatures we’ve seen recently, we’ve been taking out the powder-makers a bit more often, especially to recondition our runs that haven’t seen snowmaking this winter and make that natural snow last longer. So next time you see the pattern pictured above, you’ll know you’re skiing great conditions thanks to an old-school grooming technique!